Apprentices utilize these trainers to learn how to wire different types of systems using the latest technology. The JATC offers three Skill Improvement classes, Fire Alarm 1 (Introduction to Fire Alarm Systems), Fire Alarm 2 (Introduction to NICET certification), or Fire Alarm 3 (Troubleshooting and Maintaining Fire Alarm Systems). This lab also has several fire alarm systems that utilize older technology. 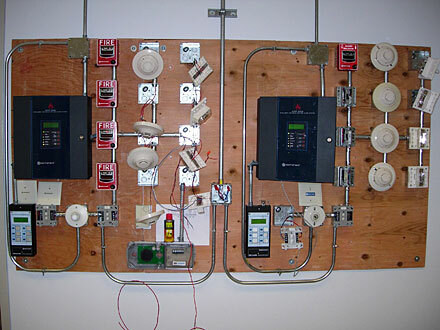 These skills are necessary to teach electricians who service old fire alarm systems.